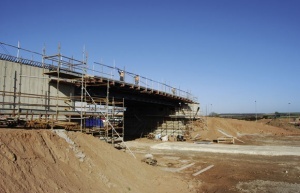 An innovative approach is being used to construct and erect bridges across the A1 between Peterborough and Blyth, where six roundabouts are being replaced with two-level junctions to ease congestion and delays. The A1 is a north-south trunk route of strategic importance and in some ways iconic, as it is one of the UK’s longest highways. Linking London with Edinburgh via the East Midlands and the North East of England, the route is for much of its length a motorway – A1(M) – grade highway. However, one of the longer stretches of dual carriageway, linking the two A1(M) sections at Peterborough in the south and Blyth in the north is currently being upgraded. According to the Highways Agency, this 110km-long section, although of satisfactory standard, suffers from severe localised congestion at six roundabouts, so they are now being replaced with grade separated junctions incorporating steel bridges. “There is quite often a lot of queuing and delays on this stretch and the works will alleviate this by allowing motorists on the A1 a clear run without roundabouts,” explains Dave Abraham, Construction Manager for main contractor Interserve. The most northerly junction of the scheme is the Blyth A1/A614 interchange near Retford. Here, as with all the other five junctions, a new steel 30m long bridge is being constructed over the existing A1 with new roundabouts either side. Interestingly at this location an innovative and time-saving procedure has been used for bridge construction. 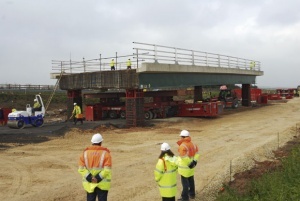 In order to reduce disruption and speed up the works process, the new bridge was fabricated on an adjacent site, at the same time as the abutments were being built. Once both were finished the bridge deck was transported as one large structure, over a distance of 200m, and jacked into its final position. While the bridge abutments were being readied, steelwork contractor Fairfield-Mabey was busy assembling the bridge steelwork on a temporary platform to the side of the new bridge position. The composite steel and concrete deck consists of six longitudinal steel beams, each 1.2m-deep arranged in three braced pairs forming a 30m-long, 13.5m wide structure. It was assembled 1m above grade and this also had the benefit of minimising working at height. Once the entire bridge deck was assembled, along with the concrete decking and edge protection, the lifting, jacking and transportation process was undertaken to transfer the structure to its final position. “Luckily there was enough space close to the bridge to construct the deck,” comments Richard Selby, Project Manager for Fairfield-Mabey. “Interserve didn’t want to transport it too far in order to minimise time and any potential damage to the bridge.” Interserve employed heavy lifting specialist Mammoet to carry out this procedure. This technique is rarely used with a steel bridge deck in the UK, but Interserve reckons it reduced the construction programme at Blyth by approximately two months. The fully assembled deck weighed 550t and to move this huge section into place Mammoet used its self-propelled modular transporters (SPMTs). These remote controlled multi-axle units transported the deck, over the recently levelled ground, to its final position were it was then jacked up and lowered on to the abutments. In the end the whole transportation and jacking process was completed in one night time operation. “The whole process went very well,” comments Mr Abraham. So well in fact that a similar operation will be carried out at the Colsterworth A1/A151 and Carpenters Lodge A1/B1081 junctions in April. These two junctions are the most southerly in the scheme and again involve new steel bridges to replace at grade roundabouts. In fact Colsterworth will require two steel bridges, one for the junction and another which will replace a troublesome A1 cross-over. The other three steel bridges on the A1 project are being erected in a more traditional manner. 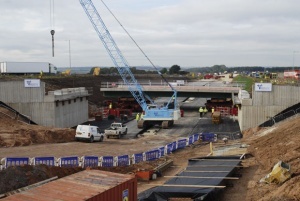 Directly south of Blyth, the Apleyhead A1/A614/A57 bridge has been completed and open to traffic since October 2007. At this junction a new dual carriageway for the A1 was constructed in fields to the east of the existing A1. New southbound on and off slip roads were built, and the new bridge connects the existing roundabout with a new western roundabout, completing a new dumb-bell shaped junction. 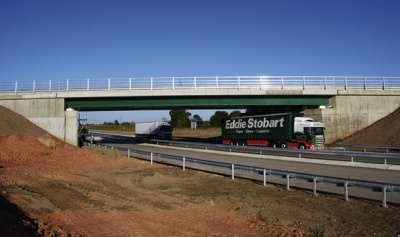 As the new bridge was constructed over a new road, traffic disruption wasn’t an issue, but all bridge beams were still delivered to site by Fairfield-Mabey at night, to minimise congestion. Likewise, the works at the Gonerby Moor A1/ B1174 junction, which includes site clearance, top- soil stripping, bulk earthworks and bridge construction, have also had limited impact on the existing A1 as the majority of work has been carried out off-line. Markham Moor, the A1/A57 junction, has proven to be the most complex. The new steel bridge has been constructed in the middle of the existing roundabout, with live traffic circulating around it both day and night. Once complete the new A1 will run right through the Markham Moor roundabout with new junctions either side of a new over bridge. After the bridge abutments were constructed Fairfield-Mabey brought the steelwork to site and erected braced beams in pairs. Keeping disruption to a minimum during the works, with the least amount of closures and contra- flows, is key to the whole scheme. “Using steel and utilising the SMPTs has ensured we’ve met this target,” sums up Mr Abraham. All six junctions are scheduled to be completed by October 2008.